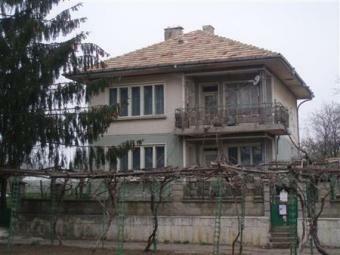 Description: A rural property 35km away from Kavarna town and golf courses. Town of Dobrich is 25km away from the property. There are all the amenities and communications needed in the village. There are electricity, water, a septic tank, a possibility for a cable TV, Internet, telephone and an asphalted road next to the property. The house comprises: On the ground floor there are kitchen big living room , bathroom with bathtub and WC, on the first floor there are three bedroom, there is also a attic floor. The house needs some renovation but its solid structure and good overall condition don`t require major repairs and offer good potential for development. With some refreshment according to your taste and requirements you can turn the house into your dream home. The Yard offers enough space for building of additional amenities such as a swimming pool, a barbeque, a garage, etc. Considering the good potential of the property and the advantages of the area - peaceful and friendly atmosphere, clean air and picturesque nature, convenient proximity to various tourist attractions - the offer is an advantageous and at the same time affordable opportunity for investment in one of the most rapidly developing regions on the North Black Sea Coast. Recently Balchik is becoming a developed golf destination. Nearby there are three 18-hole golf courses under construction - `Black Sea Rama`, designed by the leading golf professional Gary Player and `Lighthouse golf resort` by Ian Woosnam, that offer first-class entertainment for golf players and increase the investment and tourist potential of the area and Tracian Golf course. EXCELLENT BARGAIN OFFER !